This special puppy has walked its way into Barbie® doll’s heart! It’s so fun to help Barbie® doll take her dog for a walk and potty train: simply wind the knob on the puppy’s side and pull back on the leash -- the puppy starts walking all on her own! 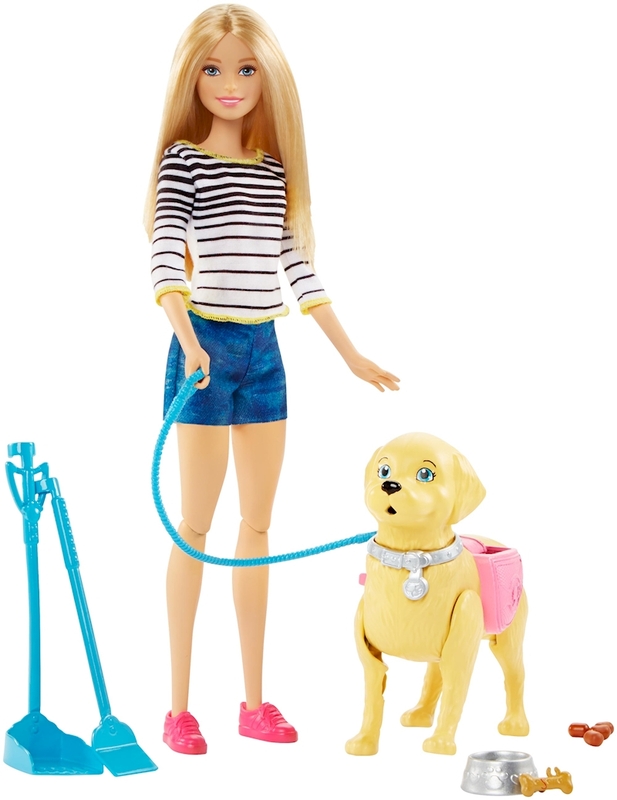 Help Barbie® doll keep up -- the leash fits on her hand for added realism. When it’s time for a potty break, push on the puppy’s tail. Barbie® doll can clean up using the broom and scooper. A feeding bowl and bone that fits in the puppy’s mouth make the perfect reward for being such a good dog! Barbie® doll’s casually cool outfit pairing a striped top with denim shorts and pink shoes is perfect for a day at the dog park. Animal lovers will have so much fun taking this adorable puppy for a walk and playing out friendship and nurturing stories between two best friends. Includes Barbie® doll wearing fashions and accessories, puppy (with leash) that walks and goes potty, broom and scooper, plastic dog “poops,” feeding bowl and dog treat. Doll cannot stand or walk alone. Colors and decorations may vary. Features: ? This special puppy really walks and goes potty for a true bonding experience with Barbie® doll! ? To start, simply wind the knob on the puppy’s side and pull back on the leash -- the puppy starts walking all on her own! ? When it’s time for a potty break, push on the puppy’s tail. Barbie® doll can clean up using the broom and scooper. ? A feeding bowl and bone that fits in the puppy’s mouth make the perfect reward for being such a good dog! ? Barbie® doll wears a black and white striped top, denim shorts and pink sneakers. ? Animal lovers will have so much fun taking this adorable puppy for a walk and playing out friendship and nurturing stories between two best friends.